From the production of the paving material, to the placement of the pavement on the road, to rehabilitation, through recycling, asphalt pavements minimize impact on the environment. The low consumption of energy for production and construction, low emission of greenhouse gases, and conservation of natural resources help to make asphalt the environmental pavement of choice. According to a study published in 2005, asphalt pavements require about 20 percent less energy to produce and construct than other pavements. While there is a reduction in energy during the construction, there is less energy consumed by the traveling public on asphalt pavement once the road is in use. Asphalt pavements can be repaired and reopened to traffic immediately. This helps minimize the congestion that leads to unnecessary consumption of fuel and production of emissions. There is no question of waiting extra hours or even days or weeks for the material to cure before the road can be reopened to traffic. The asphalt industry reclaims about 100 million tons of its own product every year, and reuses or recycles about 95 million tons. This makes it America’s number one recycler. Other materials are routinely recycled into asphalt pavements. Some of the most common are rubber from used tires, glass, and asphalt roofing shingles. Only asphalt can be the perpetual pavement. When appropriately designed and constructed, the road itself doesn’t wear out. Maintenance is simple: only the top layer is removed and replaced. This can be done quickly, even overnight, and it saves taxpayers money. The material that has been reclaimed is then recycled. The newly overlaid road surface (which may also contain recycled material) is a good-as-new pavement. Total removal and reconstruction is not needed. This is a truly sustainable construction process. When concrete pavements reach the end of their useful life, they must undergo expensive, time-consuming rehabilitation or be completely removed and replaced. This process squanders precious natural resources—unless the pavement is rehabilitated through a sustainable process called rubblization. The worn-out concrete is “rubblized” (fractured) and becomes the base for the new asphalt road. This saves fuel that would have been used by trucks hauling the old material away; saves the virgin materials that would have been needed to build a new road base; and can give the traveling public a new perpetual pavement. In addition to the environmental and speed of construction advantages, cost savings can be significant. Porous asphalt pavement systems can replace impermeable surfaces for parking lots, roads, walking/biking paths, and other applications. Porous pavements can turn runoff into infiltration; restore the hydrology of a site, or even improve it; improve water quality; and eliminate the need for detention basins. Asphalt pavements do not leach; therefore, once constructed, asphalt pavements have minimal impact on the environment. Studies show that asphalt pavements and stockpiles of reclaimed asphalt pavement do not leach. Asphalt is used to construct liners and caps for landfills. The impermeable material is an effective barrier to potential leaks. Drinking water reservoirs are often lined with asphalt. Asphalt cement is also used to line water pipes that supply potable water to humans. Oregon and Washington state fish and wildlife agencies use asphalt pavement to line their fish rearing ponds. Emissions from asphalt plants, including greenhouse gases, are very low and well-controlled. Between 1970 and 1999, the asphalt industry decreased total emissions by 97 percent while increasing production by 250 percent. Emissions from asphalt plants are so low, the EPA considers them as only minor sources of industrial pollution. The urban heat island effect is not a black and white issue. Studies show that lighter pavements reflect heat to nearby structures and actually increase surrounding air temperatures. In at least one city, the hottest heat signature is at the airport, with its thick, dense, impervious runways. When cars and trucks are mired in congestion, they consume fuel and produce greenhouse gases. Asphalt’s speed of construction allows planners and managers a way to fix congestion hot spots and bottlenecks quickly and cost-effectively. Porous asphalt systems earn credit for stormwater management. Light-colored asphalt helps to mitigate the urban heat island effect. 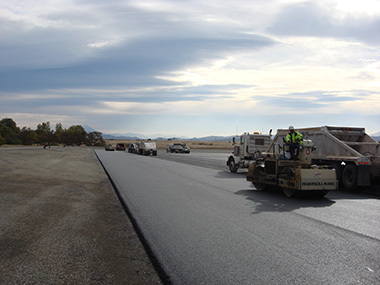 The ability to recycle asphalt pavement and the use of asphalt with high percentages of RAP (reclaimed asphalt pavement) make asphalt eligible for credits under the materials and resources heading. The fact that asphalt pavement material is produced locally can earn credits for materials and resources. Warm-mix asphalt offers several advantages which support sustainable development. When all these factors are considered, asphalt pavements can contribute more LEED credits than other pavement types.